Man Talking Hi. 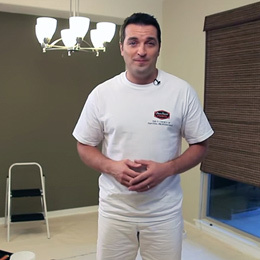 I'm Cole Schaefer professional painter and welcome to Dunn-Edwards paints how to paint video series. Believe it or not painting a ceiling can be a simple process if the ceiling is not exceptionally high. 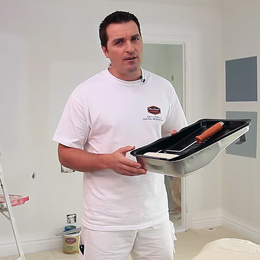 In this video I'll show you the right way to paint in ceiling plus I'll give you some time-saving tips. So chances are you don't look at your ceiling too often you may not even know what type of ceiling you have so take a look up you know I'm looking at a splatter coated ceiling, what about yours? Is it smooth is it texture if it's textured what type of texture is it is it splatter coated or knocked down or is it acoustic like popcorn? Well these answers will determine how you approach painting your ceiling. If your ceiling is textured and you want to keep this look it's best to use spray equipment to paint the ceiling. Now we recommend that you consider hiring a professional painting contractor for this type of project now you may decide to remove the ceiling texture and again we would recommend using a paint professional. Now make sure that your contractor is qualified to perform this type of work. Now if you have drywall ceiling but it looks like you could use a makeover you may want to hire a drywall contractor to do what is called a skim coat to make it smooth before you begin painting and before you hire someone we do encourage you to visit your neighborhood Dunn-Edwards paint store, we may have a solution that works for you. Finally, if your ceilings smooth and it's in good shape guess what you're ready to paint. Now you'll need to purchase a 1/2 inch roller cover roller handle and extension pole along with your Dunn-Edwards premium paint I recommend using flat finish on ceilings because it helps hide any imperfections. Items Needed for Job Other items you may need for the job include a ladder, a paint tray and liner, a wall brush for cutting into the corners, drop cloths to cover the floor furniture and other areas, spackle and a putty knife for filling in any small holes, caulking and a caulking gun to repair any cracks and corners and safety glasses to protect your eyes. Man Talking So once you have all these items you'll want to prep your room and you can learn how to properly prep a room for painting by watching our prepping a room for painting video located on dunnedwards.com/videos. So when you're ready to start painting be sure to change into some more clothes you don't mind getting paint on this includes your shoes and grabbing a hat to keep your head and hair protected. 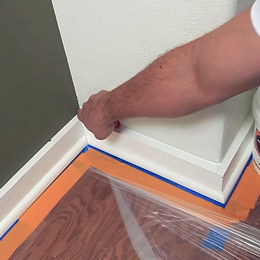 Now if you plan on painting the walls after the ceiling is painted don't worry about putting up masking tape then as you paint the walls you can create a clean straight line with the tape. Now if you're only painting the ceiling you'll want to consider using the tape on the walls and trim the ceiling using a two and a half inch angular brush. So the first step is to pre wet your roller cover to dampen it before painting as it will allow you to pick up and release paint more easily. 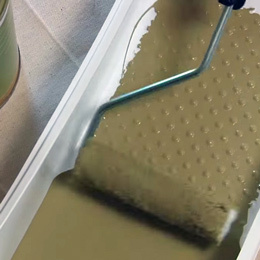 Man Painting the Ceiling Next attach your roller handle to an extension pole then slowly submerge your paint roller into the paint tray rolling it back and forth until the roller cover is evenly coated. So now you'll want to roll the ceiling in small sections beginning in one corner and rolling across the ceiling to any adjacent corner. Now depending on whether you're paying the walls or not you can use your roller to paint corners by simply rolling along the edge of the corner this allows you to skip trimming corners with a brush and will save you some time replenish the paint on the roller as needed to spread paint evenly until the entire ceiling is painted. Man talking And lastly allow the ceiling to dry completely to see if it requires a second coat of paint if it does require a second coat repeat the steps in this video and allow the ceiling to dry completely before moving on to the rest of your walls for all of us here at Dunn-Edwards paints I'm Cole Schaefer thanks for watching and happy painting.